Seahawks running back Marshawn Lynch made a brief appearance at Media Day. 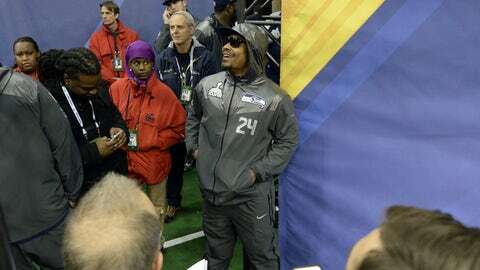 With his hood pulled tight, his sunglasses remaining on, Seahawks running back Marshawn Lynch answered question after question after question on Super Bowl Media Day. Six minutes and 20 seconds later. He then departed with a wave and a smirk, although I may be projecting that last part. The smirk at very least seem implied, the reclusive Seahawk doing the bare minimum required to fulfill Super Bowl Media Day requirements. This will be seen as Marshawn being Marshawn, or a crime against humanity. The perspective depends on who is pontificating, and how well they know him. I know Lynch hardly at all, and I do not much like what little I have seen, if I am being honest. His dismissive use of sweetheart is a sharp stick-poke for me, and do not get me started on the rap music blasting from his locker as reporters approached. Because in a week where we had good dialogue about why using "thug" is wrong and ugly and divisive, the hypocrisy of walking into a room where lyrics with "ho" and "b" were being blasting is not lost on me. All that said, I do not mind Marshawn stiff-arming media day. Not at all. If we are going to allow room for Seahawks cornerback Richard Sherman to be passionate and talkative and Broncos quarterback Peyton Manning to be brilliant and goofy, then we also have to allow for Lynch to be reticent, guarded and even cantankerous. "I appreciate that people want to hear from me, but I just go to work and do my thing. You feel me?" Lynch said. We want to fit people into boxes, and we struggle with anybody who does not go easily. This at least partially explains the confusion around a trash talking, choke-sign-throwing, Stanford grad, with dreadlocks, really smart takes on politics, and why we imbue Lynch’s unwillingness to talk with meaning. He does not act how we expect so something must be up. He hates the media and is preventing us from doing our jobs. Not exactly. Not really. Not at all. If there is a discomfort for Lynch it is in being told what to do, or so explained Seahawks coach Pete Carroll. His teammates describe an affable, friendly guy, which kind of kills the jerky narrative. And the media were not prevented from anything Tuesday. If anything, the forced march of Marshawn Lynch was a painful sideshow to an otherwise delightful group that included Sherman and Kam Chancellor and Golden Tate and on and on and on. The feel among Seahawks players was that the media were huddled around Marshawn more waiting for a train wreck than looking for insight. The talk going in focused inordinately on "Would Marshawn talk? What would he say? " Or if he said nothing, would he be fined? A better question is: Who’s really at fault in this? Not Marshawn. He’s just being him, which is being not particularly enthused by being told to talk to big groups of media. Why he has done well in Seattle is because they embrace his uniqueness. This is why Carroll has done so well in this NFL coaching stint, his unwavering belief in letting players be themselves. They have to fit into the team and values, but that is a wide berth. The genius, of course, is especially obvious with a guy like Marshawn, who does not fit into the template of good guy, which all too often is really just code for good with the media. They do not force him to be Sherman, or Sherman to be him, or more likely for them both to trend more to the middle. They get to be themselves because, as Carroll noted, that is when you get the best out of people. It is up against this standard they should be judged. Because it says nothing about Marshawn that he did not talk.